Title card of the short. 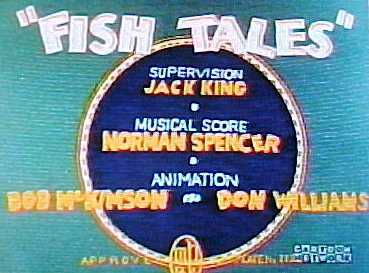 Fish Tales is a 1936 American animated short film directed by Jack King, starring Porky Pig. The film's score was composed by Norman Spencer. 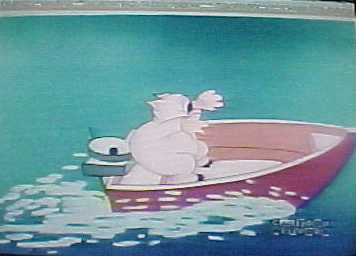 Porky Pig is going fishing. 2 worms begin to follow him and hop into his can used for holding worms. 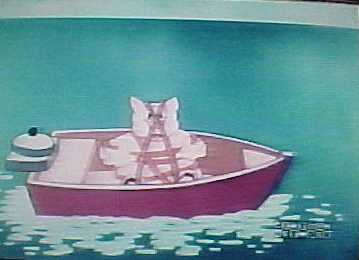 Porky’s boat then speeds up really fast, and he gets scared. 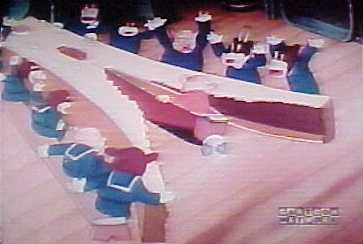 He crashes into a boat where a group of men are eating on a long table, and Porky ends up splitting it in 2. 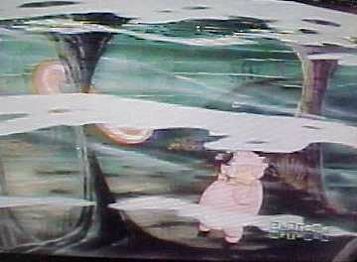 Porky’s boat, while still speeding, speeds into the water, until shooting out and starting to spin. He then spits out a fish and starts fishing. Underwater, a fish tries to fish Porky, with a Donut as bait. The Fish captures Porky, and we are then introduced to the Fish’s wife and 2 kids. 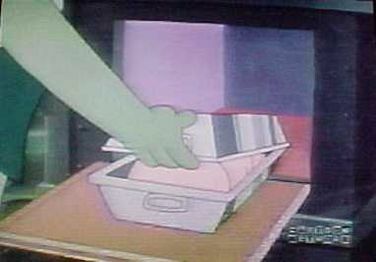 The Fish undresses Porky and tries to cook him, but he escapes. Eventually Porky escapes and then, the credits roll. Although the black and white version of the short is available online, the colourized 1968 version of this short couldn't be found. The original evidence of its existence was a website which covers different redrawn cartoon shorts and screenshots of the short. 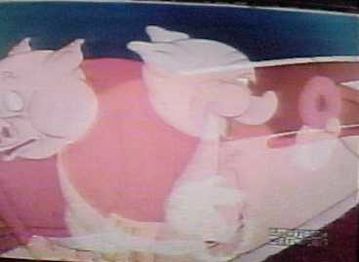 Although the short had aired on channels in the 1980s, including Nickelodeon and Cartoon Network, seemingly nobody owned a film copy of it or recorded it on VHS when it aired on TV. On December 7, 2017, the short was found by Myspleen user ChupaX. The short was then uploaded on archive.org.